Arnold Palmer’s popularity transcends generations and in fact, at the age of 84, he still draws a crowd wherever he goes. 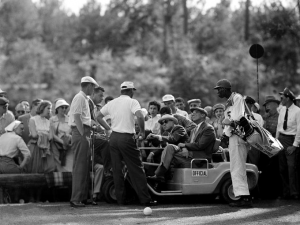 In a career that easily earned him a place in the World Golf Hall of Fame with seven majors and 62 PGA Tour wins The King was one of the reasons for the rapid growth in the number of players and fan interest in the 1950s and 60s. Of course at the same time it didn’t hurt that Palmer’s good friend, an avid golfer named Dwight Eisenhower, was President nor that television executives had found consumer products companies would stand in line to purchase advertising spots during golf telecasts so their message would be seen by golf fans who tended to have higher than average incomes. The Masters in 1958, Palmer’s first major victory, was the occasion for a curious incident both in circumstances and in the handling. Back then little was said or written about what went on and history’s judgment is Palmer was in the right. However if the same thing occurred today one can imagine a much different reaction given our media’s propensity to breathless hyper-scrutiny not to mention the bleating of the blogosphere. 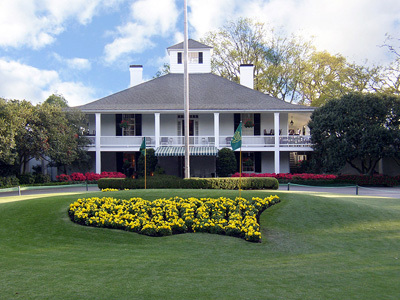 The final round of the Masters 56 years ago began with Sam Snead and Palmer in the lead, Palmer being paired with Ken Venturi who was three strokes behind. A bulky putter soon forced Slammin’ Sammy off The King’s pace but Venturi made up two shots in the first 11 holes. It’s easy to imagine the mounting tension when they reached the twelfth hole, Amen Corner’s par-3 known for unpredictable gusts of wind. Both tee shots hit on the slope behind the green, Venturi’s bouncing back onto the putting surface and Palmer’s imbedding short of the rear bunker in ground soft from the previous night’s rain. Palmer said the rules allowed him a drop but a rules official on the scene said, “No.” Palmer played the imbedded ball making a five then when back, dropped another ball and chipped to within inches of the hole for a three. Venturi two putted for a par so was Palmer still a stroke ahead or a stroke behind? Was he allowed a drop due to the imbedded ball as he thought or not? Had the official blown the call? They went on to thirteen where Palmer’s eagle to Venturi’s par made the lead three strokes again, IF the par on the twelfth was the correct score. 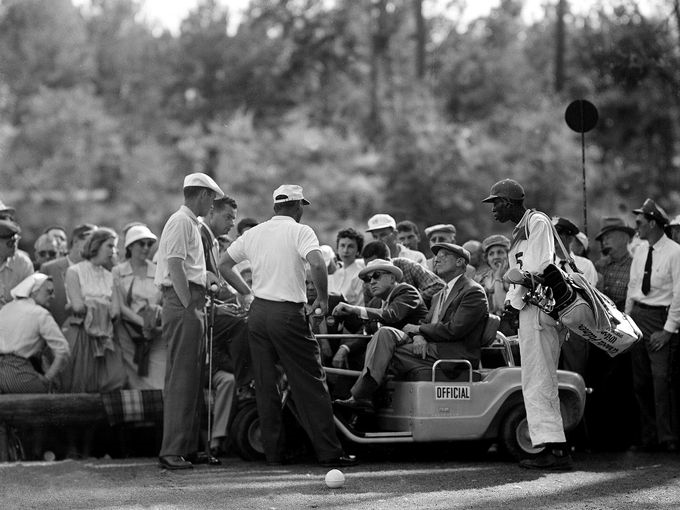 After hearing of the controversy Bobby Jones, the final authority of everything having to do with Augusta National and the Masters, discussed the situation with the two players on the next tee. On the fifteenth the word came to Palmer and Venturi that Jones, who at one time had been the world’s most famous golfer and along with Clifford Roberts founder of Augusta, had ruled Palmer’s score for the twelfth was three. Palmer went on to win the Masters that year with a 73 on Sunday beating out Doug Ford and Fred Hawkins by one shot. Venturi finished two shots behind Palmer tied for fourth. Venturi felt then and until his death Palmer ha d not followed the proper procedure in playing his second or alternate ball. He contended Palmer had not declared he would play another ball before hitting the imbedded ball. Palmer says he told the rules official he disagreed with his ruling and would challenge it by dropping a second ball. Who was right? There’s no question according to the Rules of Golf Palmer was correct and his Masters win was but the first milestone of his spectacular professional career. Venturi went on the win the US Open in 1964 but circulatory problems in his hands forced a move to the broadcast booth doing color commentary of CBS’s golf coverage for 35 years. Venturi and Palmer on the fourteenth tee discussing Palmer’s drop on the twelfth with Jones and Roberts. 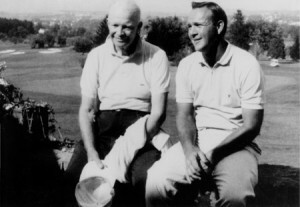 Good friends President Eisenhower and Palmer. 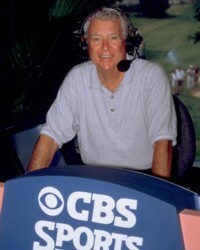 Venturi in CBS TV booth.